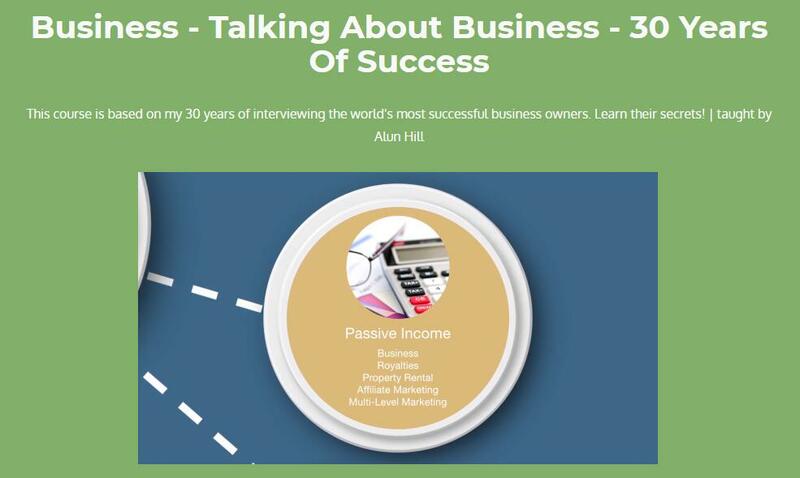 Have you ever wondered how ordinary people run successful businesses? What are their secrets? Can you be successful in business, too, if you do as they do? Well – you merely have to follow a few simple rules. And now they are all revealed in this easy to follow course! I started my broadcasting career with the BBC when I was a mere British Grammar Schoolboy. I co-hosted a weekly radio show devoted to children, the first of its kind, in what has since become known as the “zoo format”. I have since broadcast on many stations around the world, on both TV and Radio. I also now podcast on iTunes under the brand name “Talking About Business”. I own and operate the “Talking About Business” internet radio station, which broadcasts business discussions and news worldwide 24 hours a day. I write and film on business for a range of publications and websites, internationally as well as for CNN TV – with an emphasis on marketing and business growth. I also produce radio reports on travel, which are syndicated worldwide. I have advised internationally companies of all sizes on their online presence, particularly with an emphasis on Search Engine Optimisation (SEO) and video marketing on YouTube. I have trained people and companies on Copyright, SEO, Video Marketing, Online Marketing, the use of Press Releases, Twitter, Google Search and the correct usage of Google AdWords and AdSense. Published Business Books include: “Internet Marketing – All You Need To Know”, “Using LinkedIn Successfully – All You Need To Know”, “Google And Its’ Products” and “Search Engine Optimization For Beginners”. I recently retired as the Technology Editor at Gadgets and Technology News – an Accredited Google News Source. I write and film on travel for CNN, National Geographic Adventure Channel, and the Sky TV Community Channel, as well as being a “Travel Expert” for AllExperts, which is part of the New York Times Group. I travel extensively, mostly around Europe, but with occasional forays to the Far East and the Caribbean. I have written over a dozen published travel books and guides and am currently writing 2 travel books, one a guide to cruising at lower cost as well as a full guide to North Korea (the latter may well be funny, but inaccurate in parts). YouTube: I have over 25 million viewers on my main comedy / satire channel and I have several other channels, which are commentary, training and travel related. Twitter: I currently have around 80,000 followers on my two Twitter accounts. I recently retired as Council Member, Chair of Pensions and International Members Division, Member of Pensions Committee and of the Professional Practices Board. The Chartered Institute of Journalists is the oldest professional body for Journalists in the world. It was founded – as the National Association of Journalists – in 1884 and six years later was granted its Royal Charter by Queen Victoria, to protect and serve those employed in the field of journalism. The Institute combines the role of professional society with that of a trade union. “Journalists are the watchdogs of the public. We do a superb job spreading truth and knowledge, defending justice, democracy and fair play, exposing wrong-doing and seeking to make the world a better place”. “We aim to provoke, inspire, surprise, educate and entertain. Come to one of our events to find out who we are and what we’re all about. We’re a charity, proud of our diverse membership and the work we do to help student journalists. We play a leading role in the wider debate about a variety of media issues that matter both to our members and to society at large”. “The FPA was founded in 1888 and is the only association of its kind in the UK. Politically non-aligned, the FPA is one of the oldest clubs for foreign correspondents in the world. The FPA is a member of the UK Press Card Authority and provides accreditation to more than 1500 journalists every year, representing all media from news agencies to print, broadcast and internet”. “The Royal Commonwealth Society is an international education charity. With a remit to promote international understanding across the Commonwealth, especially among young people, the RCS has an impressive portfolio of charitable activities. Our Young Commonwealth Competitions encourage thousands of young people to respond to global challenges through annual creative writing and photography”. The Things Wealthy People Do Differently – And You Should, Too! Some People Don’t Reach Their Goals – Here’s How You Can! Can You Become a Wealthy Entrepreneur? Take The Test! So, What Do Wealthy People Do Differently? You Can Instantly Emulate These! Risk Reversal Always Gets The Most Sales. Always! The “419” Real Secret Finally Revealed!